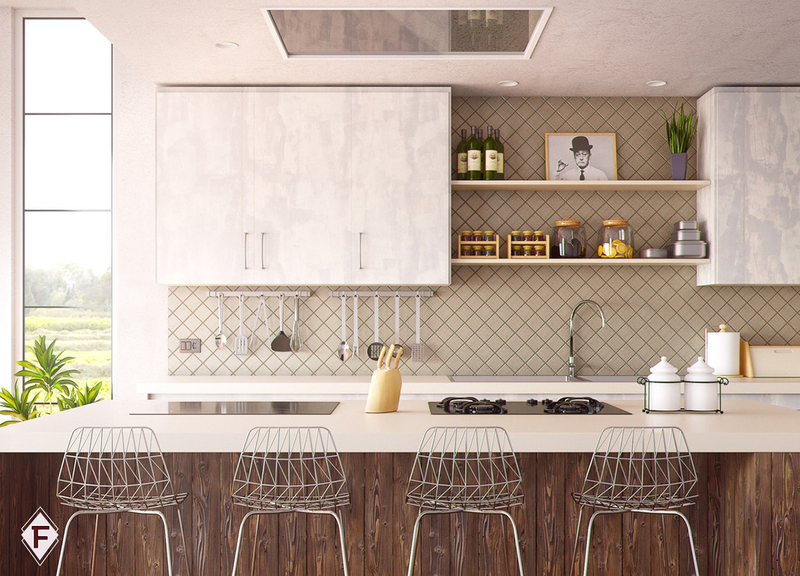 Designing your own kitchen is any homeowner’s dream. They’ve watched hours of HGTV shows and it’s finally going to pay off. They’re ready to showcase their interior design knowledge and create a kitchen their friends will envy. However, when it comes to making lasting decisions, the pressure to make everything perfect can weigh on them. Selecting natural stone, such as granite slabs or marble, for kitchen countertops will ensure longevity with proper care. The struggle is to find a backsplash that will complement the countertops and tie together the entire kitchen without overpowering the natural stone. Here are three tips to the perfect backsplash for countertops. Are you striving for serious and sophisticated? Perhaps you are aiming for a kitchen vibe that is more classy yet modern. Then again, you might be daring and want bold patterns and bright colors to reflect natural light. Whatever the style, you must have a clear idea of the style you want your kitchen to have. There’s no harm in searching for pictures or models of kitchens to get an idea of the direction you want to go. HGTV viewers know, you have to have a clear vision in mind. Identify key colors in your countertop. After choosing your natural stone for your countertops, examine the present colors in the slab. Sedna may have specs of orange. Some Chocolate Bordeaux slabs feature traces of red, while other granite slabs will just contain shades of gray and white. Identifying key colors in your countertops will give you an idea of what you have to work with. Then, you can backsplashes to highlight your favorite colors in the natural stone. Once you know the colors in your countertop, the next step is to decide which route you want to go for your backsplash. Matching colors result in a continuous flow throughout your kitchen which makes everything feel connected. Typically, the best time to choose matching colors is when you are working with neutrals - that way your colors aren’t too overpowering. Contrasting colors are a combination of colors creating a dramatic but sleek kitchen atmosphere. Take into consideration the other colors highlighted on the cabinets and floor. You can select a backsplash that will compare and contrast all of the different colors in the room, ultimately tying everything together. Another option is to choose coordinating colors. This is when you get to play off those specs of color you identified in your countertop. If your slab contains flecks of green, you can choose a green backsplash to draw that color out. Of course, it does not have to be vibrant. Coordinating colors could be as simple as choosing a light gray backsplash for a dark gray countertop. Finally, you can also choose to use mosaic tiles for your backsplash. Matching, contrasting or coordinating colors aren’t for everyone. For those who want a bold kitchen look, mosaic tiles add color, creativity and drama to kitchen designs.